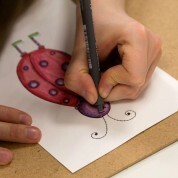 Any child's eyes will light up seeing their name spelt out using animal (or character) illustrations. 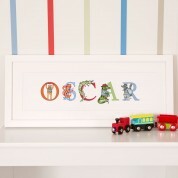 This personalised name frame complete with phonetic alphabet characters makes a fun early learning gift for children. 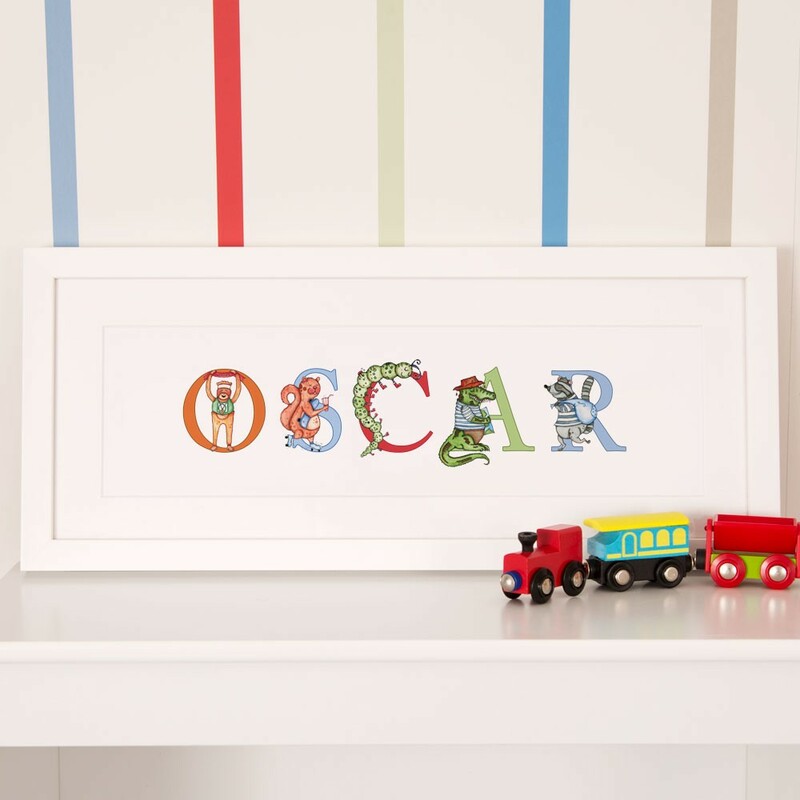 Each letter character was originally created and illustrated in house by our 'Forever Bespoke' Illustrator. Each has their own personality like 'Juggling Jellyfish' and 'Entertaining Elephant' which makes this gift the perfect aid to teach children the alphabet and how to spell their own name. Your order is made up by our graphic design team who carefully size the letters to ensure a balanced design within the frame. The design is printed on high quality paper and framed in a neutral wooden frame with a white mount – ideal match for any child's colour scheme. A wide format printer with 12 colours of ink is used to create the name. It is a special gift to give to a child for their bedroom that can be kept for many years to come. Wall fixings and gift tag (for your personal message) are included. Dimensions of white frame: approx 49 x 21cm x 23mm. Weight of frame: approx 600 grams. Dimensions of white mount: approx 46 x 3.5 cm.